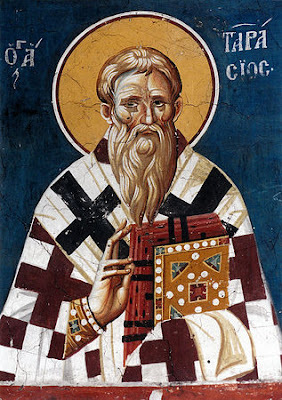 On the twenty-fifth of this month [February], we commemorate our Holy Father Tarasios, Archbishop of Constantinople. From Tarasios who was anchored and unwashed by the waves. On the twenty-fifth Tarasios flew away from commotion. Our Holy Father Tarasios dogmatized the veneration of the holy icons, which were in danger of being completely done away with and be lifted from the Church of Christ. With his cooperation the Holy and Seventh Ecumenical Synod gathered in the year 787, during the reign of Constantine and his mother Irene. Through this Synod, the Roman Emperors were turned once again to the revered traditions of the Holy and All-Praised Apostles, and the Saints of the former Ecumenical Synods, and the Holy Church of Christ was united with the Patriarchates. * Saint Tarasios was the uncle of Saint Photios the Great, who also became Patriarch of Constantinople and is celebrated on February 6th. Portions of the Sacred Relics of Saint Tarasios can be venerated in the Monasteries of Panteleimon in Mount Athos and Tatarnes in Evrytania. A model of faith and the image of gentleness, the example of your life has shown you forth to your sheep-fold to be a master of temperance. You obtained thus through being lowly, gifts from on high, and riches through poverty. 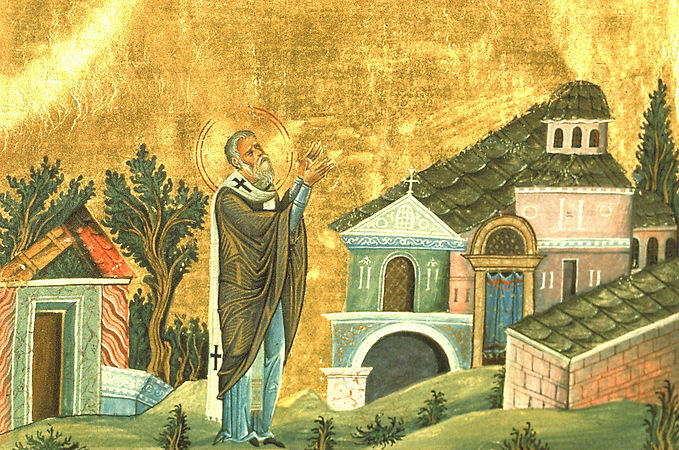 Tarasios, our father and priest of priests, intercede with Christ our God that He may save our souls. Thou didst shine as a light of the Spirit, adorned with an exemplary life and clothed in hierarchical vesture. Thou didst still the turbulence of heresy and become a pillar and foundation of the Church. O holy Father Tarasios, she praises thy struggles. Thou didst illumine the Church with Orthodox doctrines, and didst teach all to venerate and worship Christ's holy icon. Thou didst expose the godless opinion of the iconoclasts. Wherefore we cry to thee: Rejoice, wise Father Tarasios.